When you create your Hiboutik account, default payment methods are automatically set up according to your country. 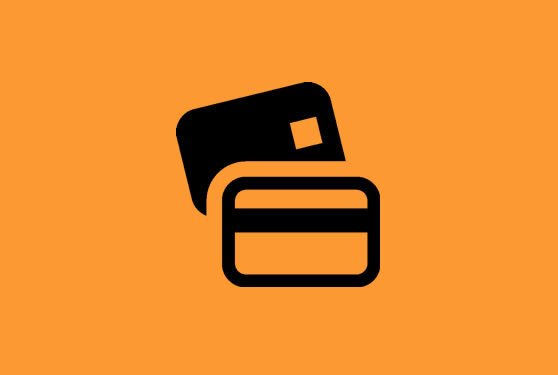 ex: for the UK, CASH and CCARD (for credit card) are the default payment types. You will also find a default payment type named DIV. You can use it for multi-payments (ex: sale paid in cash and credit card) or if the amount paid is different than the total amount of the sale. If you want to add new payment methods (cheque, debit card…), you must ask for it to our Customer Service. To contact our Customer Service, you can click on the envelope icon at the top right corner of your account or through the contact form on Hiboutik website. – or select the payment types that open your cash drawer. – click on the “Payment” button of the sale. You must then select the payment type used to pay the sale. If the sale is paid with multi-payments or at an amount different than the total amount of the sale (ex: including tips), you must use the DIV payment type button. 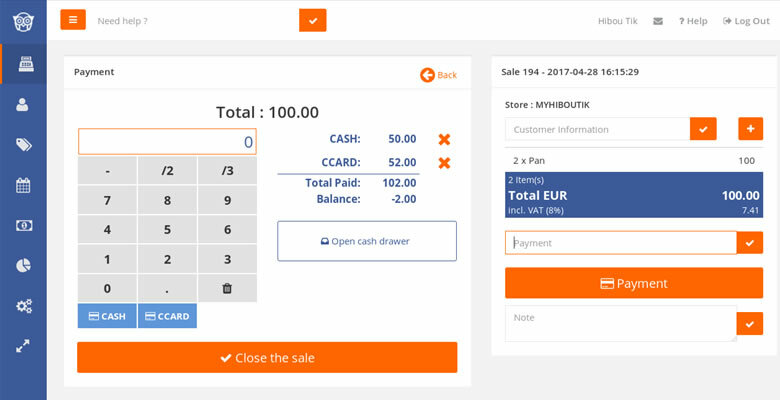 – or directly close the sale with the “Close the sale” button. The sale will be closed with your default payment method for the total amount of the sale. To display this button directly in your sale, you must enable the right in “Settings/Users/Access Management”: “Display a button to close the sale bypassing the Payment screen”. – and close the sale. Differences between amounts due and amounts paid are resumed in your end-of-day report. 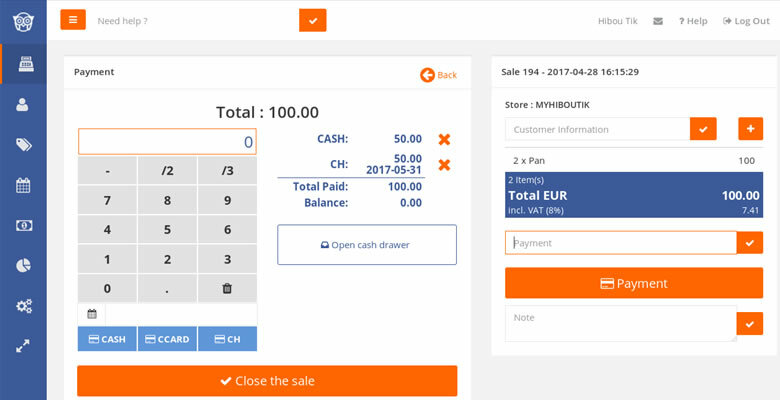 Hiboutik POS software enables to close sales with deferred payments (at a due date). You must first activate the right “Authorize deferred settlements” in “Settings/Users/Access Management”. When you select the DIV payment type, you can link each new payment type with a due date. If the due date field is empty, the payment is considered as direct. – and in cheque (deferred payment) for 50$ to cash in the 31st of May. At the due date, when you receive or cash in the payment, you must validate it in Customers/Due dates. – and all unpaid deferred payments with a due date at the date selected. Balance your payments: for accountability purposes, in a sale, you must balance payments with the total amount of the sale. If not, you will have differences between your turnover and your bank statement. Don’t confuse turnover and payment method: you cannot deduce a payment from a sale (like a negative product in a sale). For example, if your customer pays with a gift voucher from one of your partners, you should not deduce it as a discount, you must consider it as a payment method. Check your payments: you can often make some mistakes when you select the payment type. When you close your shop, we advise you to compare all amounts cashed in (bank deposit, petty cash, cheques…) with amounts in your end-of-day report. You can change the payment type of a closed sale, by clicking on its “Payment” button. If you have definitely closed you day (print a Z report), it will not be possible anymore.